There's nothing more detrimental to your pool game than a dirty, sticky shaft or a flat, glazed, mushroomed tip. If your shaft isn't looking it's best, here are four excellent tools to help you clean up your cue (which will then improve your game)! 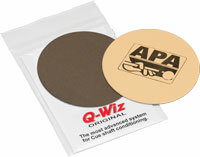 The Q Wiz is still simply one of the best shaft cleaners on the market. Use one side to clean, then flip it over to the other side to polish. Best of all, you can wash it and reuse it over and over again. Please note that this should only be used on maple shaft (do not use on fiberglass or graphite shafts as it will scratch the shaft). TMade from real 30/06 bullets (sans the gun powder of course), these pocket chalkers are ideal for holding your pool cue chalk. Standard size chalk will fit snugly into the holder and the length of the bullet helps keep it secure in your pocket. Featuring a shaper, a scuffer and a tip picker, this really may be the last tip tool you'll ever need. The shaper gives your tip a nice nickel shape, the scuffer opens up the leather of your tip and the picker aerates your tip to allow for maximum chalk retention. If you're looking for something more than just the standard nickel shape, you're going to need a more specialized tool. 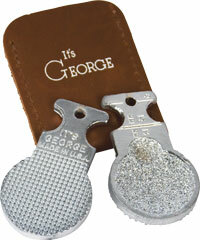 The Its George tool provides both a nickel and a dime shaper along with a really nice tip tapper. There's a reason why the pros love the Its George tool.